This article is about the wing shape. For the racing car, see DeltaWing. The delta wing is a wing shaped in the form of a triangle. It is named for its similarity in shape to the Greek uppercase letter delta (Δ). Although long studied, it did not find significant applications until the jet age, when it proved suitable for high-speed subsonic and supersonic flight. At the other end of the speed scale, the Rogallo flexible wing proved a practical design for the hang glider and other ultralight aircraft. The delta form brings unique structural advantages and aerodynamic characteristics. Many design variations have evolved over the years, with and without additional stabilising surfaces. The long root chord of the delta wing, and minimal structure outboard, make it structurally efficient. It can be built stronger, stiffer and at the same time lighter than a swept wing of equivalent lifting capability. Because of this it is easy and relatively inexpensive to build – a substantial factor in the success of the MiG-21 and Mirage aircraft. Its long root chord also allows a deeper structure for a given aerofoil section, providing more internal volume for fuel and other storage without a significant increase in drag. However on supersonic designs the opportunity is often taken to use a thinner aerofoil instead, in order to actually reduce drag. Pure delta wings exhibit flow separation at high angles of attack and high drag at low speeds. The Eurofighter Typhoon has a canard delta wing configuration. At low speeds a delta wing requires a high angle of attack to maintain lift. A slender delta creates a characteristic vortex pattern over the upper surface which enhances lift. Some types with intermediate sweep have been given retractable "moustaches" or fixed leading-edge root extensions (LERX) to encourage vortex formation. As the angle of attack increases, the leading edge of the wing generates a vortex which energises the flow on the upper surface of the wing, delaying flow separation, and giving the delta a very high stall angle. A normal wing built for high speed use typically has undesirable characteristics at low speeds, but in this regime the delta gradually changes over to a mode of lift based on the vortex it generates, a mode where it has smooth and stable flight characteristics. The vortex lift comes at the cost of increased drag, so more powerful engines are needed to maintain low speed or high angle-of-attack flight. With a large enough angle of rearward sweep, in the transonic to low supersonic speed range the wing's leading edge remains behind the shock wave boundary or shock cone created by the leading edge root. This allows air below the leading edge to flow out, up and around it, then back inwards creating a sideways flow pattern. The lift distribution and other aerodynamic characteristics are strongly influenced by this sideways flow. The rearward sweep angle lowers the airspeed normal to the leading edge of the wing, thereby allowing the aircraft to fly at high subsonic, transonic, or supersonic speed, while the subsonic lifting characteristics of the airflow over the wing are maintained. Within this flight regime, drooping the leading edge within the shock cone increases lift but not drag. Such conical leading edge droop was introduced on the production Convair F-102A Delta Dagger at the same time that the prototype design was reworked to include area-ruling. It also appeared on Convair's next two deltas, the F-106 Delta Dart and B-58 Hustler. At high supersonic speeds the shock cone from the leading edge root angles further back to lie along the wing surface behind the leading edge. It is no longer possible for the sideways flow to occur and the aerodynamic characteristics change considerably. It is in this flight regime that the waverider technique, as used on the North American XB-70 Valkyrie, becomes practicable. Here, a shock body beneath the wing creates an attached shockwave and the high pressure associated with the wave provides significant lift without increasing drag. Variants of the delta delta wing plan offer improvements to the basic configuration. Canard delta – Many modern fighter aircraft, such as the JAS 39 Gripen, the Eurofighter Typhoon and the Dassault Rafale use a combination of canards and a delta wing. Tailed delta – adds a conventional tailplane (with horizontal tail surfaces), to improve handling. Common on Soviet types such as the Mikoyan-Gurevich MiG-21. Cropped delta – tip is cut off. This helps maintain lift outboard and reduce wingtip flow separation (stalling) at high angles of attack. Most deltas are cropped to at least some degree. In the compound delta, double delta or cranked arrow, the leading edge is not straight. Typically the inboard section has increased sweepback, creating a controlled high-lift vortex without the need for a foreplane. Examples include the Saab Draken fighter, the prototype General Dynamics F-16XL and the High Speed Civil Transport study. The ogee delta (or ogival delta) used on the Anglo-French Concorde Mach 2 airliner is similar, but with the two sections and cropped wingtip merged into a smooth ogee curve. Twisting the outer leading edge down to reduce the incidence of the wing tip, which is behind the main centre of lift. This also improves stall characteristics and can benefit supersonic cruise in other ways. Moving the centre of mass forwards and trimming the elevator to exert a balancing downforce. In the extreme, this reduces the craft's ability to pitch its nose up for takeoff and landing. A conventional tail stabiliser allows the main wing to be optimised for lift and therefore to be smaller and more highly loaded. When used with a T-tail as in the Gloster Javelin, like other wings a delta wing can give rise to a "deep stall" in which the high angle of attack at the stall causes the turbulent wake of the stalled wing to envelope the tail. This makes the elevator ineffective and the airplane cannot recover from the stall. A lifting-canard delta can offer a smaller shift in the center of lift with increasing Mach number compared to a conventional tail configuration. An unloaded or free-floating canard can allow a safe recovery from a high angle of attack. Depending on its design, a canard surface may increase or decrease longitudinal stability of the aircraft. A canard delta foreplane creates its own trailing vortex. If this vortex interferes with the vortex of the main delta wing, this can adversely affect the airflow over the wing and cause unwanted and even dangerous behaviour. In the close-coupled configuration, the canard vortex couples with the main vortex to enhance its benefits and maintain controlled airflow through a wide range of speeds and angles of attack. This allows both improved manoeuvrability and lower stalling speeds, but the presence of the foreplane can increase drag at supersonic speeds and hence reduce the aircraft's maximum speed. Triangular stabilizing fins for rockets were described as early as 1529-1556 by Conrad Haas and in the 17th century by Kazimierz Siemienowicz. A true lifting wing in delta form did not appear until 1867, when it was patented by J.W. Butler and E. Edwards in a design for a dart-shaped rocket-propelled aeroplane. This was followed by other proposals, such as a biplane version by Butler and Edwards, and a jet-propelled version by the Russian Nicholas de Telescheff. In 1910 the Americans U.G. Lee and W.A. Darrah patented a delta-winged aeroplane, still of the same long slender form but with a rigid biconical wing, with each side bulging upwards towards the rear in a manner characteristic of the modern flexible Rogallo wing. It incorporated a proposal for a flight control system and covered both gliding and powered flight. None of these early examples was known to have successfully flown, although in 1904 Lavezzani's hang glider featuring independent left and right triangular wings had left the ground. The practical delta wing was pioneered by Alexander Lippisch in Germany after World War I, using a thick cantilever wing without any tail. His early designs, for which he coined the name "Delta", used a very gentle angle so that the wing appeared almost straight and the wing tips had to be cropped (see below). His first delta winged aircraft flew in 1931, followed by four successively improved examples. None of these prototypes were easy to handle at low speed and none saw widespread use. During World War II Lippisch studied a more advanced tailless delta wing of intermediate angle intended for high-speed and even supersonic flight, for use in interceptor aircraft. The Lippisch P.13a was the most developed of these projects and an unpowered glider prototype was built. The work of French designer Nicolas Roland Payen more or less paralleled that of Lippisch. During the 1930s he developed a tandem delta configuration with a straight fore wing and steep delta aft wing, but war stopped the flight testing of the Pa-22. He later flew an experimental tailless delta jet, the Pa.49, in 1954 and the tailless pusher-configuration Arbalète series from 1965. During the early postwar period the British developed several subsonic jet aircraft based on the data from Lippisch, with the first Avro 707 research aircraft flying in 1949. The Avro Vulcan strategic bomber and Gloster Javelin fighter were among the first deltas to enter production. Where the Vulcan was a classic tailless design, the Javelin incorporated a tailplane in order, to improve low-speed handling and high-speed manoeuvrability and to allow a greater centre of gravity range. In America Robert T. Jones, working at NACA during World War II, developed the theory of thin delta wings for supersonic flight. First published in January 1945, this approach contrasted with Lippisch's earlier work on thick delta wings. The thin wing provided a successful basis for all practical supersonic deltas. 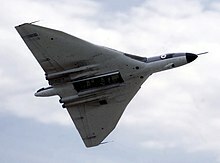 The tailless delta became a favored design for high-speed aircraft, and was used extensively by Convair and by Dassault Aviation, notably with the Dassault Mirage family and especially the highly successful Mirage III. The F-102 Delta Dagger and Douglas F4D Skyray were two of the first operational jet fighters with a tailless delta wing when they entered service in 1956. The tailed delta configuration was adopted by the TsAGI (Central Aero and Hydrodynamic Institute, Moscow), to improve high angle-of-attack handling, manoeuvrability and centre of gravity range over a pure delta planform. The MiG-21 ("Fishbed") became the most widely-used combat aircraft of the 1970s. Through the 1960s Saab AB developed a close-coupled canard delta configuration, with a delta foreplane just in front of and above the main delta wing. Patented in 1963, it first flew on the Viggen fighter in 1967. The close coupling modifies the airflow over the wing, most significantly when flying at high angles of attack. In contrast to the classic tail-mounted elevators, the canards add to the total lift as well as stabilising the airflow over the main wing. This enables more extreme manoeuvres, improves low-speed handling and reduces the takeoff run and landing speed. This configuration has since become common on supersonic fighter aircraft. 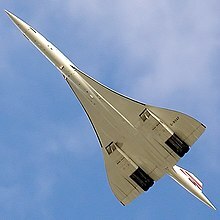 When supersonic transport (SST) aircraft were developed, the tailless ogival delta wing was chosen for both the Anglo-French Concorde and the Soviet Tupolev Tu-144, the Tupolev first flying in 1968. ^ a b Rom, Josef (1992). High Angle of Attack Aerodynamics : Subsonic, Transonic, and Supersonic Flows. New York, NY: Springer New York. pp. 15–23. ISBN 9781461228240. OCLC 853258697. ^ a b Mason, Chap. 10, Pages 9–12. ^ Boyd, Migotzky and Wetzel; "A Study of Conical Camber for Triangular and Sweptback Wings", Research Memorandum A55G19, NACA, 1955. ^ Mason, Chap. 10, Page 16. ^ Corda, Stephen (2017). Introduction to aerospace engineering with a flight test perspective. Chichester, West Sussex, United Kingdom: John Wiley & Sons. pp. 408–9. ISBN 9781118953372. OCLC 967938446. ^ Gloster Javelin History, UK: Thunder & Lightnings, 4 April 2012 . ^ Probert, B, Aspects of Wing Design for Transonic and Supersonic Combat, NATO, archived from the original (pdf) on 2011-05-17 . ^ Aerodynamic highlights of a fourth generation delta canard fighter aircraft, Mach flyg, archived from the original on 2014-11-27 . ^ "Corad Haas Raketenpionier in Siebenbürgen" [Corad Haas rocket pioneer in Transylvania]. Beruehmte Siebenbuerger Sachsen (in German). Siebenbürgen und die Siebenbürger Sachsen im Internet. ^ New Rocket Guide (pdf), NASA . ^ Orłowski, Bolesław (Jul 1973), Technology and Culture, 14 (3), JStor, pp. 461–73, JSTOR 3102331 . ^ Wragg, David W.; Flight Before Flying, Osprey, 1974, pp.87-88, 96. ^ a b Woodhams, Mark and Henderson, Graeme; "Did we really fly Rogallo wings? ", Skywings, June 2010. ^ Lee, U.G. and Darrah, H.; US patent 989,7896, filed 15 February 1910, granted 18 April 1911. ^ Ford, Roger (2000). Germany's secret weapons in World War II (1st ed.). Osceola, WI: MBI Publishing. p. 36. ISBN 0-7603-0847-0. ^ "New Triangle Plane Is Tailless", Popular Science, p. 65, December 1931 . ^ Madelung, Ernst Heinrich; Hirschel, Horst; Prem, Gero (2004). Aeronautical research in Germany: from Lilienthal until today (American ed.). Berlin: Springer. ISBN 3-540-40645-X. ^ Wohlfahrt, Karl; Nickel, Michael (1990). Schwanzlose flugzeuge : ihre auslegung und ihre eigenschaften [Tailless aircraft: their design & properties] (in German). Basel: Birkhauser. pp. 577–78. ISBN 3-7643-2502-X. Retrieved 13 February 2011. [Lippisch Delta I and Horten H I] Both these aircraft shown, how not to do it. ^ Grommo (17 May 2008), Lippisch P13a Supersonic Ramjet Fighter footage (video), Youtube . ^ Hygate, Barrie; British Experimental Jet Aircraft, Argus, 1990. ^ Partridge, J (1967), Number 179 – The Gloster Javelin 1-6, Profile . ^ Richard Hallion, Lippisch, Gluhareff and Jones: The Emergence of the Delta Planform, Aerospace Historian, March 1979. ^ Sweetman, Bill & Gunston, Bill; Soviet Air Power: An Illustrated Encyclopedia, Salamander, 1978, p.122. ^ Green, W; Swanborough, G (1994), The complete book of fighters, Salamander, pp. 514 tp 516 . Bradley, Robert (2003). "The Birth of the Delta Wing". J. Am. Aviation Hist. Soc. Wikimedia Commons has media related to Delta wings. Look up delta wing in Wiktionary, the free dictionary.